Vintage Mid Century Modern NuTone Tubular Chime Door Chime Bell Working . See the pictures. Used, in excellent condition; this was replaced with a fancier 4-note version. Has brass tubular chimes; 3 tubes, the middle one is purely decorative. Ding-dong for front door; dong for back door. The tubes resonate so the sound carries better through the house. Shipping will require two boxes; one for the tubes and one for the mechanism. Masterpiece Series. Antique brass finish. Photos show all three that are available. This is only for ONE doorbell. 3 1/4" Square. Condition: Very good. 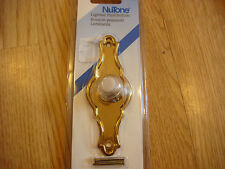 NUTONE LIGHTED PUSHBUTTON. SOLID BRASS. Honest mistakes do happen! "The Concord" Solid brass with a special baked lacquer protective finish prevents tarnishing. Broan NuTone. 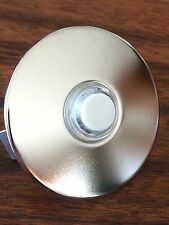 Lighted Bell Button. Polished Brass. Rectangular Surface Mounted. Removable Light Bulb. NuTone provides a wide selection of Pushbutton Doorbells and this one is no exception! All with a design and style that reflects your personality! Lighted pushbutton for visibility after dark so anyone can find the doorbell. Broan NuTone. Traditional Bell Button. Polished Brass. Round Surface Mounted. Includes Matching Color Screws. Ultra-RARE Antique Vintage Unique Ornate NuTone Door Chime Doorbell Model K-20! This is in great condition and was saved from a very old building that was due to be demolished. I obviously cannot test this to see if it works but it had been prior. This is great for use or for display as a collectors piece. I have a few listed. Lighted Pushbuttons. OUR PROMISE TO YOU. Top Products. Why Choose BuildInc?. Replaces NuTone CD131SWHBULK. 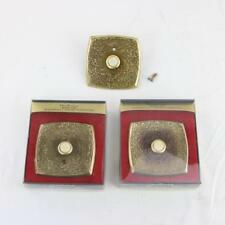 One lighted polished brass stucco push button. NuTone provides a wide selection of Pushbutton Doorbells and this one is no exception! All with a design and style that reflects your personality! Wired / Unlit. The weather resistant Polished Brass finish will give you many years of dependable service. Part # PB27YLPB. Made by NuTone. Wired Surface Mount Stepped Arch Design. Broan-NuTone Masterpiece Door Bell. It has a design of smooth white cover with rounded corners to combine with builder finishing techniques. This is the footer. More links or text can go here. Product Details. There is a small dent in the rim (not overly noticeable). Screws included. The Nutone PB41LSN is a lighted round stucco pushbutton in satin nickel. This model has an ultraviolet inhibitor touch pad surface and non-stick action. Recess mount design fits stucco surfaces and brick molding, allowing you flexibility of surface installation choices. All with a design and finish to suit even the most discriminating of tastes. Lighted pushbutton for visibility after dark so anyone can find the doorbell. Recess mount works with most typical siding or door trim installations. Lighted pushbutton. Surface mount. Check back daily for new deals! Computers & Tablets. DVD & Blu-Ray. Sporting Goods. Condition: New. Fits brick molding. Wired or wireless installation capabilities make for quick and easy installation in 15 minutes or less for most applications. Easy installation for main doorways; and side doors can be included. Lighted pushbutton door bell. solid polished brass.